Expanding its Therml=Block™ product line, Tubelite Inc. announces TU24650 Series storefront system with a dual pocket poured-and-debridged thermal break. This new storefront is part of Tubelite high-performance thermal framing systems designed to address today’s fast-track construction schedules and stringent energy codes. Even in extreme cold climates, Therml=Block products provide superior energy and condensation resistance performance using multiple thermal barriers, while providing structural integrity and aesthetic flexibility. Tubelite TU24650 storefront is engineered for use on ground floor storefront or protected low-rise applications and tall openings up to 14 feet high. It may be specified as part of a complete offering of Therml=Block entrance, storefront and curtainwall systems, or individually as needed. This storefront system has been tested per AAMA 1503-09’s standards, achieving a U-Factor of 0.31 for thermal transmittance and a frame condensation resistance factor (CRFf) of 75. 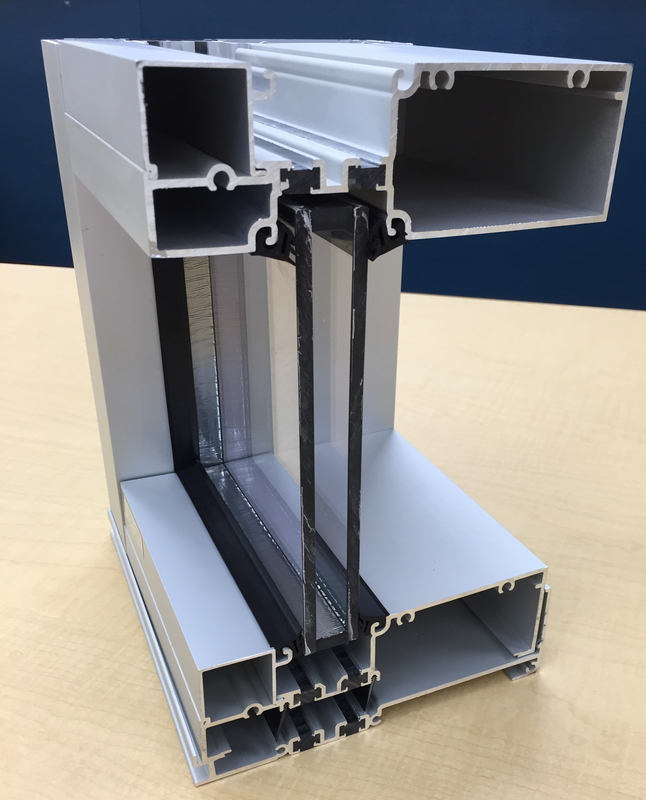 “Our new TU24650 dual thermally broken storefront improves U-Factors by 36 percent and increases CRF by 30 percent over a single poured-and-debridged pocket when using the same size and type of insulated glass,” said Mary Avery, Tubelite’s marketing director. Label certificates validating energy performance for Tubelite’s TU24650 Series storefront can be obtained from the National Fenestration Rating Council (NFRC) Component Modeling Approach (CMA) program. Azon’s Lancer™ mechanical surface conditioning of the aluminum extrusion cavity ensures long-term resistance to shrinkage of the polyurethane barrier. Beyond performance, Tubelite TU24650 storefront aesthetically matches T14000 and TU24000 storefront systems’ glass plane. Its 2-by-6.5-inch profiles also complement other Therml=Block products’ 4.5-inch system depth for a pleasing reveal. The aluminum framing can accommodate glass or panels up to 1-inch thick. Verticals can be steel-reinforced for high performance against strong windloads. Members can be assembled using screw spline or clip joinery, and framing is compatible with Tubelite Medium and Wide Stile Therml=Block Doors. Tubelite 3700 Series operable windows also can be glazed into the storefront framing pocket for natural ventilation. The aluminum used to produce all of Tubelite’s storefront, window, entrance and curtainwall systems can be extruded using EcoLuminum™, a high recycled-content aluminum billet composition. The aluminum is finished in a choice of seven anodized finishes or 20 standard paint colors, or, upon request, blended and custom colors may be specified. Durable finishes reduce buildings’ maintenance costs and enhance long lifecycles. Coupled with TU24650’s recycled aluminum content, daylight, views, energy-efficient thermal performance and condensation resistance, these attributes also may support projects seeking LEED® certification or other green building criteria.